I feel like I offer a constant refrain of NO: No you can't do that. No you can't buy that. No you can't watch that. We're not going wild and crazy, no rules/no budget; but this summer I vow to say YES to the little things. If it doesn't cost much, then YES, we will try it! If you clean up after yourself...YES, you can do it! If you want to create/go/perform/cook...then my answer is YES! 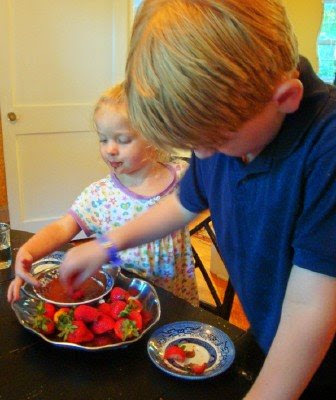 We began with chocolate dipped strawberries. Who knows where we'll end? "no, we can't go to atlantis in the bahamas!" but yes, to a slip and slide outdoors in the back yard! Thanks for the inspiration, Meredith! This is one of my goals this summer! I had exactly the same thought as school got out last week. I am trying... it is so hard for my control freak self with five kids in the house (plus their friends)! But Workin' MAMA is absolutely right, there is such a great release. And somebody has made chocolate chip cookies every single day! I just keep telling myself: Almost anything is washable! I said yes to snow cones yesterday afternoon. It helped that we had coupons. Great post, Meredith. Saying no so often has to do with me thinking of me instead of my littles. Thank you for the encouragement to make it the other way around (and if we're raising our kids to think thankfully and frugally, so much of what they want is easy to say yes to anyway!). I am always saying No to Gavin. Evan is so different than his brother. Evan is a get outside and play boy. He loves to bike, run, do karate, and swim...Gavin would spend every minute on the X-box if I let him. He gives me a really hard time when I limit it. School is out here on Wednesday. I am not looking forward to the fighting with him this summer over the games. I have told him he much earn the right to play the games by reading books this summer. Hope that is the right thing to do. So many times I reflexively say "no" and then think to myself "why not?" I'm going to make a real effort to be more accommodating to my children this summer. Thanks for the inspiration. Great inspiration! I read somewhere out there about really thinking about why you are saying No to something (many times is is just out of convenience or weariness)- most times a yes answer is a better solution. I think saying Yes makes for happier children. Often "No" is just a habit we get into, and as far as the budget goes, they will be grown before you know it. If you can afford to do simple pleasures, then by all means DO IT! You won't regret it when they are gone, and you won't break the bank either. This very thing has been on my mind a lot lately. It bothers me when I think about it that likely the reason for my "no's" to the little things is my selfishness. I'm trying to think before I say no and use the children's ideas as opportunities to spend time with my children. After all, don't children feel love that way? I blogged about this a while back...at least the not saying, 'no' as much. We work on idol replacement in our house. This is a real tough one for me. I'm working on it this summer though! I'd really like us all to have a fun summer before the new baby gets here and I'd really like them to be used to doing fun things on their own (instead of messing/whining) after the new baby gets here. They learn a lot of independence when I say "YOU can try it." I came to a similar conclusion about parenting last night! Our son has been somewhat frustrating to deal with lately, and we seem to be constantly at odds this past week. I'm trying to say yes more, but also to respond with hugs and understanding instead of scolding and immediate no's. I hope we all have a more pleasant week! Meredith, I've been thinking a lot about this myself. I say no SO MUCH. So I'm working on saying yes, too. The truth of the matter is that all of the times that you say no, make each yes a little sweeter. You seem to have found a good balance--and summmertime is the perfect time for a little more leeway. Have lots of fun! One more thing .. saying "no" all the time is the sign of an exhausted, frustrated, worn out mom - I think. Great post Meredith! I'm jumping on this train... My daughter and I have been butting heads a LOT lately and I'm in agreement with Sandi, I think a lot of it is due to exhausted, frustrated mom saying "no" more than I should. Let's get together again soon, BTW! Hope you are feeling better. "Instead of saying no, how can we say yes?" It was in regards to a young teen who wanted to run a camp under the umbrella of an organization but really didn't fit requirements. Instead of telling her no, we listed what hurdles had to be crossed before we could say yes. ie: we require a minimum age of 16 before you can supervise children. But I loved that concept. Don't just say no, let them know how that no can be a yes. No, you can't have chocolate, but if you eat your vegetables at the dinner table, then you can have a piece of chocolate for dessert! So glad that I can finally comment again...the blog has officially begun! Our little guy is now 10 months and we've talked about how children hear "NO" so many, many more times than "YES!" in our world. I know I sure did as a kid. We are making an effort even now to use redirection versus just always saying "no, no, don't touch that" or "no,no, don't harass the dogs and cat" or any number of other things he already gets into! You are such an inspiration to me! You were before I was married and before I was a mommy and now you are more than ever! Thanks for all you do. what a wonderful point for moms! good for you...you're a fantastic mother! keep up the good work and don't be weary in your well doing! That's where I'm at, too. My automatic reaction is, "No." But I've been making myself think before I say it, too. So many things my kids ask for can easily be a "Yes," if I'm willing to be inconvenienced just a tiny bit. Thanks for the reminder!! I like what Linda said. Not only saying "yes", but saying, "Yes, let's try that together." Building those memories, and sealing that bond. That's how I want to spend my summer. However, I will say that it is hard sometimes to say yes to all 8 still at home wanting to do something different!! Oh my!! When the kids were younger we tried to do this too, say yes as much as possible. Sometimes it was errrr.....rather creative trying to come up with an alternative, lol! But I really do think it's a great idea! We still try to do that and our kids are 16 and 20, lol! Fantastic post! We live in a touristy area and I have gotten into the habit of saying "no" simply because I didn't want to deal with parking and crowds. Even free or cheap activities like the beach or zoo (of which we are members) were put on my mental off-limits list because of the anticipated hassle. However, after taking some visitors around the past few weeks I realized its not really that bad (especially in the morning), and my son and I both felt refreshed, and exhausted in a good way, from doing a wider variety of activities. Thanks for reminding me of this -- my daughter has been asking for a while to do chocolate dipped pretzels, and I keep saying, "Not right now." I think that tomorrow may just have to be a "yes" day. Thank you for this reminder and inspiration. Sometimes I find myself pulling "no because I said so (meaning no because it's not my idea or my timing)" that I so hated hearing as a kid when I am overtired and just struggling to keep on going. I need to remember that one of the most important things I can do for my family is get enough sleep! It's not a "yes" but even a "later" can be a more positive answer than a reflexive "no"... sometimes we can't drop everything to supervise out little ones painting, but a "later" answer, especially if it's specific, such as "We can't paint now but when the baby is sleeping we'll get out the paints" is sometimes a fair compromise. I hear myself say 'no' or 'stop' all the time. yuck! Thanks for the gentle reminder to say yes. I just posted something similar this morning and the I come and see you are saying it too. I think I'm supposed to learn something here! Meredith..stop eavesdropping in my home....have you been hearing my kids beg for messy craft time?? may i just add....we should also be saying YES! to our husbands...(and not just that way!) but the little requests too....and maybe occasionally saying YES to ourselves for little indulgences..
we spent lots of fun times doing crafts and cooking together, playing games and getting the work done together. and no really meant no so don't ask again. rarely did I have whiney children and for the most part, we were all happy. I have a habit of saying yes first, but always adding my qualifier - for example 'Sure, you can play outside, just as soon as you've finished your 'zone today' and read a chapter of your book to me!' It works so well to motivate the children and help them understand that we'll have lots of fun just as soon as we get the work out of the way. They attack their work with an eagerness that shows just how much they want to get on with the fun - and they have learned to do it right the first time because they'll just have to do it all again if it isn't right - and I've learned age appropriate expectations - they are capable of much more than I ever thought, but perfection is really quite over-rated! And some times, just to change it up I throw in unqualified yeses and they are overjoyed - in fact I heard son tell daughter that they must have really 'worked hard on their school work, 'cause mama let us do water play before zone cleaning ...' and he was right - they had been on their game for schooltime! Plus it was hot and water play was what I'd be doing if I were 8 or 11! This is a good reminder. I try to say yes as much as I can. However, I feel your pain Dawn (almost) because I have 5 children (ages 8,6,6,5, & 5)and in that respect I say my fair share of "No's". But, I remember as an only child being bored beyond compare because my parents didn't say yes much and didn't let me cook and generally didn't do alot of fun family things. I really don't want to be a mom the kids remember as never letting them do anything fun, creative or messy. Or anything requiring help from adults. Tomorrow is "waterhose Wednesday" where they can play in the hose without me worrying over the water bill (well, I might still, but I'll try not to let them know). They've been begging me to do it and I've said no, but I told them today that we would do it once a week starting tomorrow. I try to use the same philosophy!